To validate a radial imaging spin-echo diffusion tensor (RAISED) sequence for high-resolution diffusion tensor imaging (DTI) of articular cartilage at 3 T.
The RAISED sequence implementation is described, including the used non-linear motion correction algorithm. The robustness to eddy currents was tested on phantoms, and accuracy of measurement was assessed with measurements of temperature-dependent diffusion of free water. 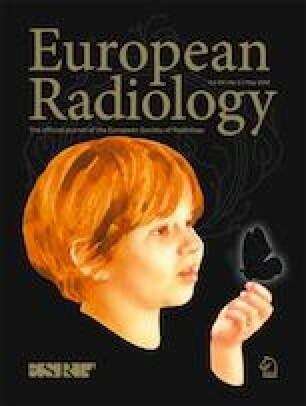 Motion correction was validated by comparing RAISED with single-shot diffusion-weighted echo-planar imaging (EPI) measures. DTI was acquired in asymptomatic subjects (n = 6) and subjects with doubtful (Kellgren-Lawrence [KL] grade 1, n = 9) and mild (KL = 2, n = 9) symptomatic knee osteoarthritis (OA). MD and FA values without correction, and after all corrections, were calculated. A test-retest evaluation of the DTI acquisition on three asymptomatic and three OA subjects was also performed. The root mean squared coefficient of variation of the global test-restest reproducibility was 3.54% for MD and 5.34% for FA. MD was significantly increased in both femoral condyles (7–9%) of KL 1 and in the medial (11–17%) and lateral (10–12%) compartments of KL 2 subjects. Averaged FA presented a trend of lower values with increasing KL grade, which was significant for the medial femoral condyle (-11%) of KL 1 and all three compartments in KL 2 subjects (-18 to -11%). Group differences in MD and FA were only significant after motion correction. The RAISED sequence with the proposed reconstruction framework provides reproducible assessment of DTI parameters in vivo at 3 T and potentially the early stages of the disease in large regions of interest. • DTI of articular cartilage is feasible at 3T with a multi-shot RAISED sequence with non-linear motion correction. • RAISED sequence allows estimation of the diffusion indices MD and FA with test-retest errors below 4% (MD) and 6% (FA). • RAISED-based measurement of DTI of articular cartilage with non-linear motion correction holds potential to differentiate healthy from OA subjects. This study has received funding from the (US) National Institute of Arthritis and Musculoskeletal and Skin Diseases (NIAMS) of the National Institute of Health (NIH), Grant/Award Number R01AR067789. The scientific guarantor of this publication is José G Raya, PhD.